In this policy, references to the Company include all subsidiaries and controlled entities of the Company, except where a subsidiary or controlled entity is listed on a stock exchange and has its own policy on dealing in securities. Restricted Persons are encouraged to be long-term holders of the Company’s securities. However, it is important that care is taken in the timing of any purchase or sale of such securities. The purpose of this policy is to assist Restricted Persons to avoid conduct known as ‘insider trading’. In some respects, the Company’s policy extends beyond the strict prohibitions of the Corporations Act 2001 (Cth) (“Corporations Act”). The establishment of a policy in relation to trading by Key Management Personnel is required by ASX Listing Rule 12.12. Where a Restricted Person is not a member of Key Management Personnel the member or members of Key Management Personnel who have a relevant relationship with the Restricted Person are required to ensure that the Restricted Person is provided a copy of this policy and complies with this policy. communicating the inside information to persons likely to be involved in a dealing in the relevant investment product. includes matters of supposition and matters insufficiently definite to warrant being made know to the public. The Board has established the following policy in relation to trading in the Company’s securities (including shares and options) by Restricted Persons. The policy reinforces the Corporations Act prohibitions on insider trading and addresses the requirements of ASX Listing Rule 12, as well as including additional provisions to ensure good governance. Trading of securities by Restricted Persons is only allowed when the particular person is not in possession of inside information (as defined in Division 3 of Part 7.10 of the Corporations Act) and (subject to limited exceptions) the trading occurs during a Permitted Trading Period. Where a Restricted Persons wishes to trade during a Permitted Trading Period, no consent is required, although notification of the trade must be made in accordance with clauses 28 and 30 of this policy (as applicable). For Restricted Persons that have been so advised by the Company Secretary (“Relevant Persons”), at any time when the Relevant Person is in possession of material information about the Company which has not been disclosed to the market pursuant to ASX Listing Rule 3.1A (“Relevant Person Prohibition”). The Company Secretary will notify all Restricted Persons or Relevant Persons (as applicable) by email when a Prohibited Period commences and ceases. In the interests of good corporate governance, the Company has extended the policy to a broader category of Restricted Persons (as outlined above). however, except in relation to clause 13(a), trading of securities by Restricted Persons is only permitted when the particular person is not in possession of inside information (as defined in Division 3 of Part 7.10 of the Corporations Act). Where clause 11(a) applies, trading by Restricted Persons in Marquee Resources securities may be permitted where there are exceptional circumstances and with prior approval obtained from the Chairman, or in the case of trading by the Chairman or a Restricted Person who is a Restricted Person by reason of their association with the Chairman, from the Board. Exceptional circumstances are severe financial hardship or a pressing financial commitment that cannot be satisfied otherwise than by selling Marquee Resources securities. a tax liability, but only where the relevant person has no other means of satisfying the liability. A tax liability relating to securities received under an incentive scheme would not normally constitute exceptional circumstances. The Chairman may confer with the Board as necessary when considering a request. A request for clearance is to be completed using Form A and will be answered within 2 ASX trading days and may be answered via email. If approval is given to the Restricted Person where exceptional circumstances apply, the relevant Restricted Person must deal in accordance with that approval within 5 ASX trading days of the approval. If dealing does not occur within this time period, the approval will lapse. Confirmation using Form A may be provided via email. Approval to trade where there are exceptional circumstances does not relieve the relevant Restricted Person from compliance with clause 8 or the obligations imposed by the Corporations Act. For example, if the Restricted Person is or becomes aware of inside information, then trading is not permitted. Any approval may also be revoked at any time. The prohibition on insider trading under the Corporations Act includes dealings in securities of other companies with which the Marquee Resources Group may be dealing (this includes dealings related to their customers and partners). Where a Restricted Person has inside information about other securities, they should not trade in Marquee Resources securities or securities in the other company (“Other Securities”). Individuals working on a transaction or project may be notified that they may not trade in the securities of other entities involved in the transaction or project. In addition, individuals who become aware of inside information in relation to Other Securities in connection with their work for the Company must notify the Company Secretary. The Company Secretary is to update and advise any person to whom the restriction on trading in Other Securities applies (“Relevant Persons”) via e-mail. Trading in those securities by Relevant Persons will be prohibited until the restriction is lifted. The Board may also identify certain securities as Other Securities for the purpose of this policy and may specify the Relevant Persons to whom the restriction on trading in securities applies. Trading in those securities by Relevant Persons will be prohibited until the restriction is lifted. The Company Secretary will e-mail Relevant Persons to advise of any changes to the identified Other Securities from time to time. Restricted Persons must not enter into transactions in products associated with shares or options in the Company that operate to limit the economic risk of holding the shares or options in the Company during a Prohibited Period, and must not enter into transactions in products associated with shares or options in the Company that operate to limit the economic risk of holding any unvested shares or options or performance rights in the Company at any time. Restricted Persons must not trade in any securities of the Company (including shares, options, contracts for difference, warrants, or derivatives) for speculative reasons or short-term gain. Where a Restricted Person has a margin loan which is secured in whole or in part by Marquee Resources securities, that person or entity must provide details of the margin loan and the number of Marquee Resources securities being secured by the loan to the Company Secretary within 2 ASX trading days of the margin loan being obtained. Prior to any trading by a Restricted Person except trading referred to in clause 13 the Restricted Person must notify the Chairman (or in the case of the Chairman or a person who is a Restricted Person because of their relationship with the Chairman, the Company Secretary) at least 24 hours before conducting a trade. Marquee Resources must notify the ASX on behalf of a director of any acquisition or disposal of a relevant interest in Marquee Resources securities by a director within 5 business days. Directors must notify the Company Secretary within 2 ASX trading days of details of trading in Marquee Resources securities in which they have a relevant interest using Form A or B (as applicable) so that the Company Secretary can notify ASX within the required timeframe. The Company Secretary will provide a copy of the ASX release to all directors of Marquee Resources. Where a Restricted Person not covered by clause 28 conducts a trade in Marquee Resources securities where approval is not required under this policy, they must notify the Company Secretary using the Form B within 2 ASX trading days of undertaking the transaction. The Company Secretary will also maintain a Register of Notifications, Requests and Trading to record requests and trades in Marquee Resources securities. I request permission to trade in the following securities, which are held, or proposed to be held, by a Restricted Person*. 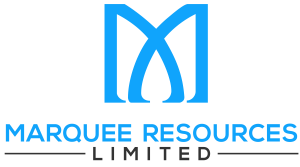 Marquee Resources Securities – Shares or Options? No. of Securities Buy/Sell/Exercise & Hold/Exercise and Sell Prohibited Period? * Approval to trade does not relieve the relevant Restricted Person from compliance with clause 8 of the Trading Policy or the obligations imposed by the Corporations Act. For example, if the Restricted Person is or becomes aware of inside information then trading is not permitted regardless of whether approval has been provided. Any approval may also be revoked at any time. I am not in possession of any price-sensitive information regarding the security. I may be refused permission to deal without explanation. I will not deal in the above securities until approval is given. If approval is given, I will be entitled to trade for a period of 5 ASX trading days provided I do not have any inside information. After this time, approval will lapse and further approval will be required. Forward to the Company Secretary following an acquisition or disposal of securities where prior approval is not required.